You’re searching for a top rated curling wand, that’s effective and within your budget line. Perhaps you need to create a hairstyle that will once and for all impress your co-workers, or perhaps you are looking to spice up your look for a night out. Whatever may the reason be, a top rated curling wand is what you need to produce the curls that are sumptuously smooth and that will last for hours upon hours and that without much effort. This a list of the bestselling, most popular, top rated curling wands on the market. These products were gathered from among the best companies in the hair care industry. For more information on the important aspects that make a great curling wand, read below the table. 1 The Remington Pearl is the best selling curling wand worldwide. The great quality and the affordable price of this product combined gives you the opportunity to make a best value purchase. 2 The Orange Crush is a great product made by Bed Head; a leading hair care company worldwide. This product is reliable and durable. This is a sturdy product that is unlikely to break. It heats and cools quickly and evenly along the barrel. 3 The You Curl and Big Waves is a cone-shaped curling wand. It is one of Conair's bestselling, most beloved hair cair product. This product is fun and easy to use, it provides a smooth and effortless curls without much effort. 4 The 4 in 1 by Cortex is an amazing product. This is a high-product most used in salon. The infrared technology coated on the barrel of the wand makes hair smoother and healthier. It heats quickly and very safe to use. 5 The Rock 'n' Roller is a ceramic coated wand made by another world renowned company, Bed Head. This product is easy to use and is best when you're on the go. This product give you the possibility to use a higher than standard heat temperature, which can be useful if you have thick, long hair that don't stay put for periods of time. Different barrel sizes and shapes for greater style flexibility. Some curling wands are made in the shape of a cone. This allows you to create curls of varying size, quickly and efficiently. For instance, if you want small curls; you would roll your hair around the upper (smaller) end of the wand. If you’d want bigger curls; you’d use the lower, thicker end of the wand. Others provide interchangeable barrels of varying sizes, which will allow you to have any style you want, at any given moment. These are very popular and widely used in hair salons because they provide ample style flexibility. Come at an affordable price. Easy to use, quick to heat up. The best curling wands are light and are heat up in less than a minute. Safe to use, hair damage protection, low fire hazard. Good quality wands are equipped with a heat indicator light along with a stand. Most companies also provide heat-resistant gloves with their wands, which help you roll your hair around the barrel without getting burned. Note: to further protect your hair, use a heat protection spray before applying them onto your wand. If you have question regarding the specifications or purchase of a top rated curling wand, please do not hesitate to write a comment. The 4-Play Pro is a versatile, professional, titanium-made Cortex curling wand that enables you to recreate the look of a salon-quality hairstyle. This product will not hold you back to only certain styles. You have the option of styling using four different barrel sizes (1/2″, 1″, 1 1/2″, 2″). For example, if you want to achieve a gorgeous, old Hollywood look, use the 2” barrel for large dramatic curls. If you want a natural, carefree beach wave look (of the likes of Kate Hudson), then use the 1/2” or 1” barrel and slightly tussle your fingers throughout your hair. This curling wand offers great flexibility, which allows you to change your hairstyle whenever you want to. If you find yourself needing more options, click here to see more curling wand options. The main concern with the heated curling products is if they will cause long-term damage to my hair. The exception is a few, like the 4-Play Pro Cortex curling wand. This product will in fact protect your hair leave it better off after styling with its ionic and far-infrared heat technology. Ionic hair products will restore your locks to their natural glow. Here’s how it works: harsh chemicals, static electricity and improper hair products can damage your hair and leave it positively charged. Ionic technology sends negative charges throughout the hair follicles and reverses the damage, leaving your hair silky smooth after use. The far-infrared heat technology from the 4-Play Pro Cortex curling wand heats up the hair delicately and efficiently by going to the core of the hair follicle. This is the reason why the hair remains on the wand for only a few seconds. Traditional metal curling wand require more setting time and, therefore, will damage your hair. The 4-Play Pro Cortex curling wand is highly-praised by it’s users. Most rave about the 4 interchangeable barrels, which are a great money-saver, if you want a greater range of hairstyles. Customers also admire the really short time it takes for the hair to set in the wand, which provide long-lasting curls that hold throughout the day. The 4-Play Pro is different than the traditional curling iron since you wrap your hair around the barrel with the included protective glove. You won’t get unsightly clip marks and it’s superior technology will leave your hair smoother and silkier after use. Most customers highly recommend it to others seeking professional-level results. Bottom line: This is a great product, which will leave you satisfied. If you have any concerns, questions on comments relating to the specifications and/or purchase of this great Cortex curling wand, do not hesitate to write a comment in the box below. Curling long hair can be problematic, which makes finding the best curling wand for long hair really important if you want to achieve a certain hairstyle. Long hair has more weight, which can be difficult to to style without the proper equipement. Here is the top 5 best curling wands for long hair, whether you want tight curls or loose waves, these products are designed to give you a great salon finish. When looking for a reliable product for curling hair, there are a few things to look out for. First, you want a curling iron that heats up quickly and nothing on the market does that better then ceramic irons. Curling wands that reach higher temperatures produce longer lasting styles that won’t fall out quickly, especially for longer hair. Also, you want to look for an curling wand that is designed with safety in mind. Indicator lights and protective gloves are a plus when trying to find a product that produces salon results and isn’t a safety hazard. It’s also smart to use an effective method when curling your hair, and each of the following products cater to whichever way you’re used to when styling your hair. First, the Tstudio Ceramic curling wand, is a product from Remington, which you can pick up on Amazon for under $25. This product combines leading technology with elegant design, providing you with great quality results. The wand can quickly reach temperatures of up to 400° degrees and comes complete with a high technology, 1.5 “ barrel along with a ceramic coating which caters to those with longer hair. Whether you’re looking for thick, luscious curls or adding waves to your long hair, this product is sure to please. It has a great review on Amazon for reaching a high temperature quickly, and being very easy to use. The next we have the White Curly Q Tapered Iron by Hot tools, is an another great product offered on Amazon. This high-end product heats quickly and comes with a heat resistant glove. Its tapered to curl in three different sizes, ranging from ¾" to 1 ¼". This product provides an ultra-smooth, frizz free surface of hair that is easy to style. It also has a separate on/off switch with a power indicator light so you don't make the mistake of thinking it’s off when it’s not. This product has received positive feedback from many people who have used it, many mentioning how quickly it heats up and how the tapered design allows for tighter curls and looser waves. Third, If you’re looking for a reliable, effective curling wand that has a unique design, then look no further because the Rock-n-Roller by Bed Head delivers in spades. Complete with a technology of tourmaline ceramic, this wand helps create shiny curls without the frizz. The wand has a clam-free wrapping-and-go design, which prevents undesirables hair kinks. This product has a tangling free swivel cable, a heat protection glove and a handy stand to prevent burns. This product is highly-praised by reviewers for being easy to use while providing great style for those with long thick hair that usually never hold a curl. Fourth, the Curli Pops Tourmaline Ceramic by Bed Head, which comes in a wonderful hot pink color and lets you create wonderful hair styles for your long hair while looking good doing it. This particular design of curler allows for creating loose curls at the top with tighter curls at the bottom. The tourmaline ceramic technique allows for a frizz free experience, producing that perfect, shiny style your used to seeing only at the salon. The only snag seems to be that this iron only comes with one temperature, which can limit the quality of the style depending on the thickness of your hair. Finally, the You Curl and Big Waves by Conair, a popular brand name when dealing with many different styling products, from shavers, to blow dryers, and of course, curling irons. This combo package comes complete with 2 different barrel sizes (1.25 inches and .75 inches), tourmaline ceramic technique, and quick 30 second instant heating capabilities to produce tight curls or loose waves; perfect for those with longer hair. The package also comes with a 3 finger glove to protect against burning, and we can expect the same quality that Conair provides with their many other products. 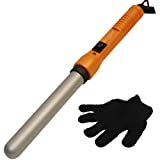 Most who reviewed this curling iron made mention to how consistent and easy it was to use, as well as the length of time their curls remained after only using it once. If you have any questions about the product or the it’s purchase, do not hesitate to make a comment in the box below. Hopefully, this article has helped you find the product that you need for your long hair. There are many different options when it comes to styling your long hair with wonderful curls and luscious, loose waves and this without breaking your bank. Completed with safety features to prevent getting burns or accidentally leaving your wand on, these curling wands are safe to use. Be sure to check them out, hoping you’ll find the best curling wand for long hair that will give you the dashing look you want. You want the best curling wand for your weave that will give you beautiful curls without compromising quality and budget. Perhaps you have a straight weave and would like to curl up a few locks, or maybe your looking to spice up your hair for your nights out. No matter what may be your reason, we can help you choose a curling wand that will best fit your hair and style. First, establish whether or not you can use a curling wand on your weave without damaging it. If your weave is made of natural human hair, then you’re in the safe. If your hair is made of synthetic fibers, you risk disintegrating or melting your hair. In general, the lower end weaves will not be able to withstand the heat of your curling wand. On the other hand, higher end synthetic weaves made of monofiber or thermofiber will resists the heat. Consult with your hairstylist before using the curling wand on your weave. Use a heat protection shampoo (recommended), to let your hair/weave keep it’s natural, healthy look. Your hair may become damaged after unprotected frequent use of the curling wand. To counter this affect, simply use a heat protection shampoo, which will effectively protect your hair from the heat and give your hair proper nourishment to keep it looking fresh and healthy. These curlings wands are safe to use on your weave and come at a low-set price. These high-quality items are made by some of the greatest personal care companies in the world. If you wish to purchase one of this products, click on the product link and follow further instructions. The Pearl Digital Ceramic Curling Wand is high-performance and reliable and made by Remington, a worldwide well-known, highly-praised company. The ceramic-coated shaft heats quickly (30 seconds max), which is great when your on the go. This is a high-quality product, which is safe to use on your weave. Backed by a four year guarantee. The Bed Head Orange Crush is a heavy-duty, reliable product. Made by Bed Head, this high-end product will gives you salon quality style without breaking your budget. The shaft of the wand is coated by tourmaline, which will give your hair a smooth, effortless look without damaging your weave. The Conair You Curl and Big Waves Curling Wand is easy and safe to use. This product comes with a small and big wand shaft, which allows you curl your hair in either small, tighter curls or bigger, looser curls. This product will give you great control over the style of your hair and comes at an affordable price. The Curly-Q Nanoceramic Curling Wand is a higher-end nano ceramic coated wand produced by Hot Tools, a reputable company established in California. hich will give you smooth, easy to style hair without the undesirable frizz. The Rock 'n' Roller Ceramic Wand is an easy to use bubble wand. This wand is great if you want to create looser curls, which will give your hair a tussled look. The product also comes with a safety-stand, which lets you safely lay down the curling wand. If you have any further question, write a comment in the box below. I hope I’ve helped you find the best curling wand for your weave. Until then, take care.